It all started as a dream. After working together for more than ten years in a standard practice, it was time for a change. We sat and talked about where our lives were headed. We both had spent years in a field that we loved ... but how could we improve and take it a step further? How could we blend our individual talents together in a profession with so much diversity? We decided to be different and in doing so, build a path that others could follow. Over the years we had seen an over-abundant need for home care for companion animals. There was no question that not only was there a demand, but a shortage of mobile practices that could address a wide variety of client and patient needs. As we developed our ideas, we also discovered that no one had successfully created a full-service mobile veterinary practice in the state of Virginia since new legislation had been passed. Our challenge had begun.Our first step was to obtain our "wheels", which required a trip to Iowa. Many clients have asked us if our 24 foot long truck is difficult to drive. Well, the answer is, not after you've driven it from Iowa to Virginia. A crash course to be exact. We encountered a snow storm in Iowa and sleet in the deep mountains of Pennsylvania. We learned quickly. Once we returned, the fun had just begun. In order to meet Virginia requirements, our vehicle needed structural modifications to build a surgery suite, followed by a road trip to Richmond for the state veterinary board to tour and approve our modifications. It was a difficult road but we succeeded.After months of planning, organizing, building and driving we were ready to roll. 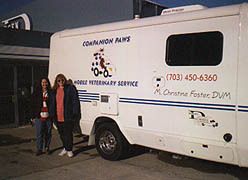 On May 6, 1996, Companion Paws took to the roads of Northern Virginia. We were overwhelmed, to say the least, by the reception that we received. In our first week, we almost hit a woman who cut us off in rush hour traffic - only to run up to our window and ask for a brochure! Most importantly however, was the unanimous response by clients that the concept was long overdue. We were also touched by the positive response we received from other veterinarians - who were extremely supportive. It seems like an eternity since we first sat together and contemplated "I wonder if this would work?" Although exhausting at times, I know that we are both extremely happy with the development of this practice. We have met, and continue to meet many wonderful clients and their pets ... all of whom make our jobs extremely rewarding. We take pride in knowing that we have made a positive difference for many clients and patients and we look forward to growing and continuing to do so for years to come.